detail, "Tinker to Sayers to Grace", the first of 3 walls comprising the 64 ft. long mural located at ESPN Zone, Chicago. 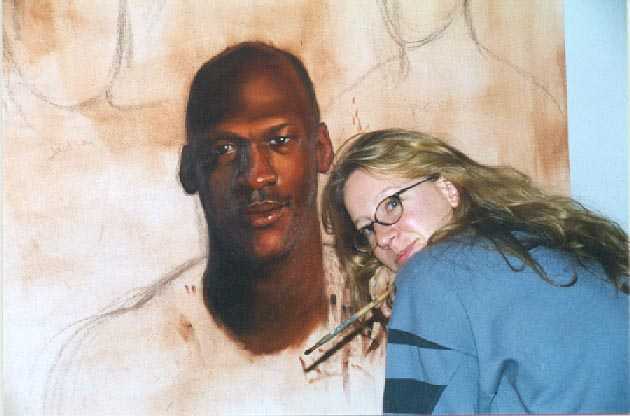 Stephanie Roberts works on the portrait of Michael Jordan, one of the figures in the last panel of the mural. 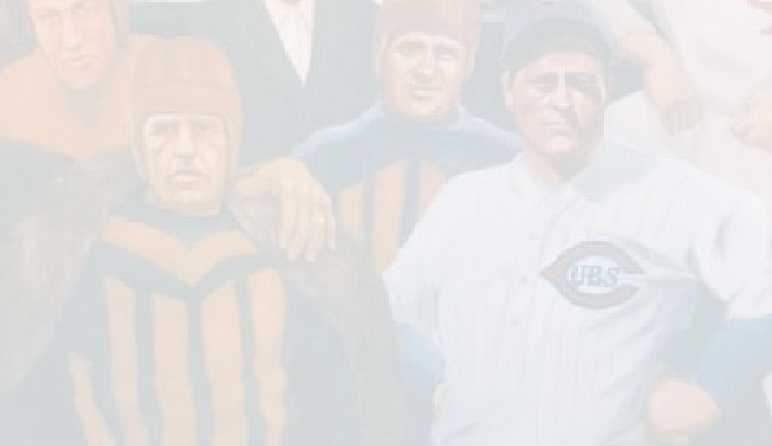 This wall begins at the turn of the century, and includes figures such as Shoeless Joe Jackson, Red Grange, Bronko Negurski, and Sid Luckman. When the in-your-face vibe of the new ESPN Zone entertainment complex is stripped away, the sports-themed installations from 21 local artists will create its enduring character. The 35,000-square-foot bar/arcade/eatery at 43 E. Ohio opens to the public Sunday. The high-tech ESPN Zone is heavily interactive. The artwork is sports unplugged. The complex is peppered with pieces that range from Jocelyn Nevel's ambitious quilt of Chicago White Sox baseball cards to Stephanie Roberts and Dan Addington's mural of Chicago's 80 greatest athletes covering 100 years. The oil and canvas mural, titled "Tinker to Sayers to Grace" has been the most popular installation with customers who attended ESPN Zone's test openings during the last few weeks. Done in 15 4-by-5-foot panels, the mural wraps around the 75-seat Bristol Suite in chronological order. It begins with the Chicago White Stockings first baseman-manager Cap Anson and concludes with Los Angeles Lakers coach Phil Jackson and a boy running into the distance with a basketball symbolizing future legends to come. "What's interesting is how the mural promotes discussion on who should be on and who was left off," said Roberts, a 28-year-old native of Columbus, Ind., who was reared in Wichita, Kan. The Roberts-Addington work has a caricaturist edge that suggests Midwestern muralist Thomas Hart Benton. ESPN provided Roberts with a list of local athletes, and Roberts and Addington also did research. Who failed to make the cut? "There's a lot of 81st persons," Roberts said. "[Cubs announcer] Ron Santo was one. [Cubs catcher] Gabby Hartnett was another one. [Blackhawk] Keith Magnuson was right up there." ESPN paired artists with ideas. 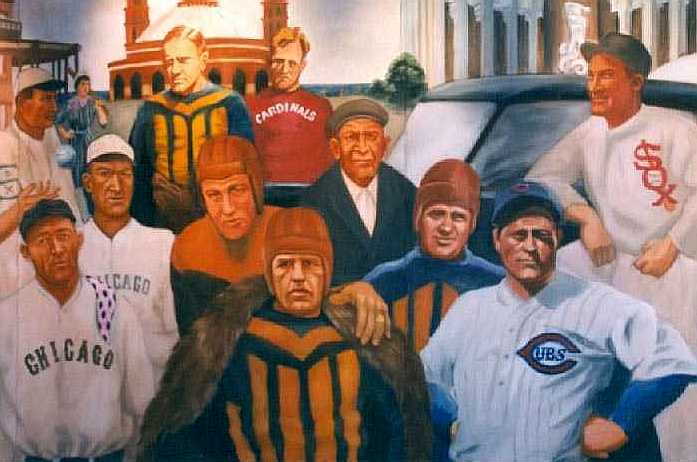 The company also acquires sports memorabilia, such as the baseball cards incorporated into the Nevel quilt, specifically to be used in artwork. The project was coordinated by New York-based Disney consultant Steven Diamond. The artists were paid for their work, "but maybe not as well as they or I might dream of," Diamond said. ESPN would not disclose terms of the commissioned deals. ESPN Zone was developed by Disney Regional Entertainment, which also operates DisneyQuest. "It's important the pieces function on an art level," Diamond said. "It has to satisfy the die-hard fan, but it also has to occupy someone who may not know the history."